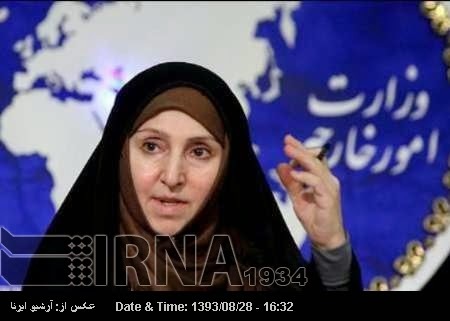 Tehran, Nov 19, IRNA – Foreign Ministry spokeswoman Marzieh Afkham on Wednesday condemned any instrumental and political use of human rights against independent states by the western countries. Afkham's condemnation was in reaction to a human rights resolution endorsed by the third committee of the 69th General Assembly meeting. She said, "It is a source of regret that the UN human body are abused by western states. For the same reason, the Islamic Republic of Iran rejects compilation, endorsement and content of such resolutions." She emphasized that the resolution on human rights condition in Iran was drafted and passed in the 69th UN General Assembly session with Canada playing a key role. She added that the endorsement is a follow up of the process in the past few years without taking realities on the ground into consideration. The spokeswoman drew a comparison between recent resolution and the previous ones and said this time, more countries opposed the political and selective approach of Canada. Afkham said the resolution was prepared, using unreliable sources and based on the information provided by terrorist groups in a biased manner, being full of baseless, forged and undocumented claims. Also referring to the documented and justified responses of the Iranian government to the claims raised in the UN resolutions, Afkham said if impartiality and merely professional side of the work was taken as the main criterion, there would would be no need for issuance of such a resolution. "In our opinion, efforts by certain western governments to endorse such non-genuine resolution under present conditions of the regionwhich has been gripped by the Zionist regime's crimes, terrorism and organized extremism, are aimed at insisting on a wrong policy of pressurizing independent states," she added.